I've just become aware of the ACT Government's consultation for a new license plate slogan. Hosted at Your Say, the government is asking for ideas for a 30-character or less slogan, with the best ideas to be put to a public vote later this year. I support this type of consultation approach - it provides for broad public input, with a screening step (via a panel of judges) to manage any inappropriate suggestions before a public vote. The consultation also does a great job of explaining the process timeframe; when the decision will be made and when the license plate will be released. One of the 'tricks of the trade' for consultations - and and engagements - is to ask the minimum number of questions required to meet the purpose of the process. While there's often temptation to ask a few additional questions, where data might be interesting but is non-essential to the consultation's purpose, each additional question can reduce the response rate significantly. These additional non-essential questions can also call into question what the consultation is actually designed to achieve. This can, at worst, lead to suspicion and loss of trust, but at minimum is likely to cut the honesty and number of responses, potentially damaging the ability of the consultation to achieve its purpose. Sometimes, of course, there can be questions that appear non-essential but are necessary for the consultation to achieve its goals. In this case, the organisation engaging should make it as clear as possible why the questions are being asked, without damaging the engagement process itself. Unfortunately it seems that the ACT government hasn't fully thought this through in its license plate slogan consultation. 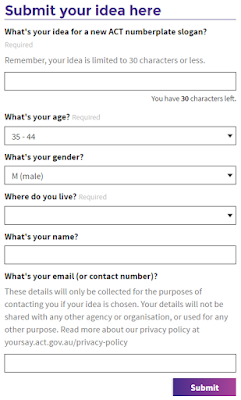 Alongside asking for the slogan and where the respondent lives (important for getting ideas expressly from Canberra residents), the slogan also asks for the name and a contact number/email, as well as age and gender. While the consultation does a good job of explaining why name and contact information might be useful, so that the finalists and winning respondent can be contacted, it's unclear why either age or gender are required in this process. Age is a compulsory field while Gender is optional, but realistically neither is important information in the review process, nor is there an explanation as to why the ACT government would need this information. Now this might seem a trivial thing to the agency involved in the process, after all age and gender aren't hugely personal information and, in the case of gender, is often determinable from name alone. 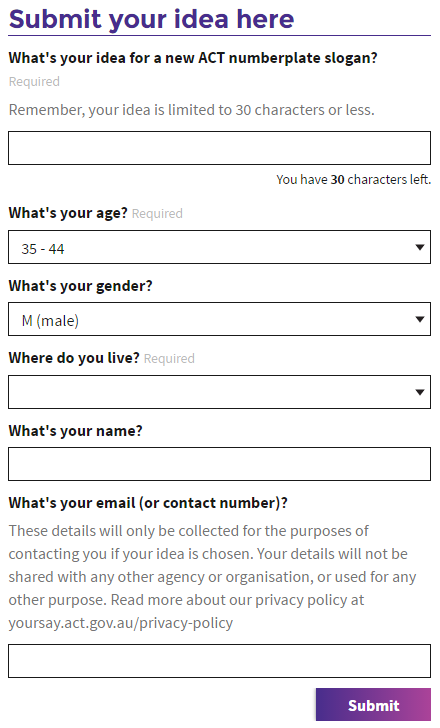 However by adding these fields - whether compulsory or not - the response form becomes that much more complex, and can discourage some people from responding. That doesn't mean that this process won't get a good response rate, but it is likely to be less than it would otherwise be. Of course it's hard to prove this in this case, as we don't have the luxury of an AB test to compare approaches - but from experience, overall responses go down when additional (and unnecessary) questions are asked.